He's the brown and white spotted member of the family. Exactly where your beautiful brown and white German shorthaired pointer loses his hair can give your vet clues for diagnosis and treatment. Pointers are vulnerable to several skin disorders accompanied by hair loss. Depending on the diagnosis, it can be a minor cosmetic issue or a life-threatening disease. German shorthaired pointers are among the breeds afflicted with the hereditary disorder follicular dysplasia. The disease causes your dog's hair to slowly but steadily fall out, giving him a moth-eaten appearance. Symptoms typically start when he is a puppy. Although his skin becomes dry and scaly, follicular dysplasia doesn't otherwise affect his health. Your vet likely will take a small skin sample from to diagnose the ailment, a procedure typically done in the office under local anesthetic. She might recommend supplements containing fatty acids to combat the dry skin or special shampoos or lotions. If your dog licks his paws, base of his tail or any body part so much that the hair comes off, your dog may have a lick granuloma. Licking and subsequent hair loss results from varying causes but is not uncommon in German shorthaired pointers. These symptoms include allergies, dermatitis, emotional issues -- licking calms the dog -- boredom and infections. Not only is your dog likely to lose his hair and develop lesions, in severe cases he can become lame or end up with fibrous masses on the licked area. Take your dog to the vet, who likely will perform a biopsy and recommend treatment based on the individual granuloma. That might include medication or bandaging for more mild cases or surgery or radiation for serious granulomas. German shorthaired pointers are the only canines to suffer from lupoid dermatosis, according to the German Shorthaired Pointer Club of America. Affected dogs develop hair loss and painful, itchy lesions between the ages of 6 months and 3 years. Lupoid dermatosis begins on the face, but progresses to the ears and back. These sores may come and go. Lesions can become infected, with the dogs also experiencing swollen lymph nodes and fever. Your vet likely will conduct a skin biopsy to make a definite diagnosis. As of 2013, no effective treatment exists, according to the club. Related to cutaneous lupus erythematosus in people, German shorthaired pointers with lupoid dermatosis eventually develop kidney disease and die, according to the German Shorthaired Pointer Club of America. 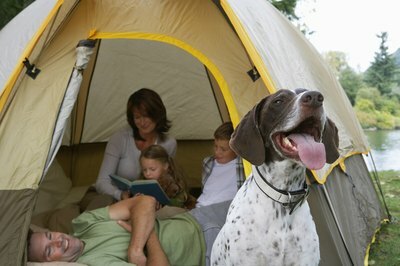 Not all alopecia, or hair loss, in German shorthaired pointers is hereditary. Many dogs experience hair loss from allergies, whether from food, fleas or the environment. For a sensitive dog, even one flea can drive him crazy, causing itching and hair loss. Fortunately, your vet can prescribe a monthly oral or topical flea and tick medication that should solve the problem. Food or environmental allergies typically require skin and blood testing. With food allergies, it's often a long-term process of elimination until you and your vet find a food that suits your dog. Environmental allergies could be seasonal, when pollen and mold fills the air. Your vet might prescribe medication and advise you to keep your dog indoors as much as possible during allergy season. Air-conditioning or an air cleaner can provide some relief. University of Prince Edward Island: What is Follicular Dysplasia?